This week my friend, Yvonne Anderson, launched the second in her “Gateway to Gannah” series, Words in the Wind. Readers of the first book, Story in the Stars, will be happy to know that Dassa and Pik are back, but won’t be surprised to hear that both are faced with the biggest challenges of their lives. Marooned in a desolate canyon on the other side of the planet, Dassa struggles to survive and to separate reality from illusion. Meanwhile Pik, thrust into a leadership role he never sought and doesn’t want, struggles to maintain Gannahan unity while his family is torn apart. The question for them and those they love is: Whose words echo in the wind? Yvonne’s first book, The Story in the Stars, is a finalist in the Speculative Fiction category of this year’s Carol Awards, sponsored by ACFW (American Christian Fiction Writers). 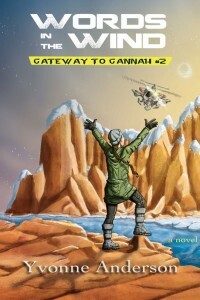 You can learn more about Yvonne’s series on the “Gateway to Gannah” page on her blog. Check out interviews with Yvonne at The Big Thrill, a publication of International Thriller Writers, or on Lena Nelson Dooley’s blog. Lena’s blog offers a chance at a free copy of Words in the Wind. Words in the Wind is available at Amazon or from the publisher, Risen Books. Regular readers may remember I interviewed Yvonne last fall and posted my review of The Story in the Stars this spring. I’m reading Words in the Wind for the second time and hope to post a review of it at a later date.